Preheat outdoor grill for 30 minutes on medium high. Prepare muffin tin by placing cupcake wrappers inside the tin. Set aside. In a large bowl, combine cake mix, water, oil, and egg. Fill each cupcake wrapper 2/3 cup full. Place 1 tablespoon scoop of the fruit spread on top of the batter in each cup. Place cupcake tin inside preheated grill. If possible, turn the heat from one side of the grill off and place the cupcake tin over the side where there is no direct flame. Close the lid on the grill. Turn the heat down to medium (or if the cupcakes are being cooked over flame, turn grill to the lowest setting possible). Do not open the grill lid for 20 minutes. After 20 minutes, open the grill and test to see if the center of the cupcakes are set. If not, cook just until the center of the cupcakes spring back when touched lightly. Remove cupcakes and cool completely. In a large stand mixer, whip whipping cream until stiff peaks form. Add Betty Crocker whipped vanilla frosting and beat until fluffy. Pipe icing atop cooled cupcakes. Garnish with fresh strawberries. Serve and enjoy! If making in the oven instead of on the grill, bake as directed on the cake mix package. 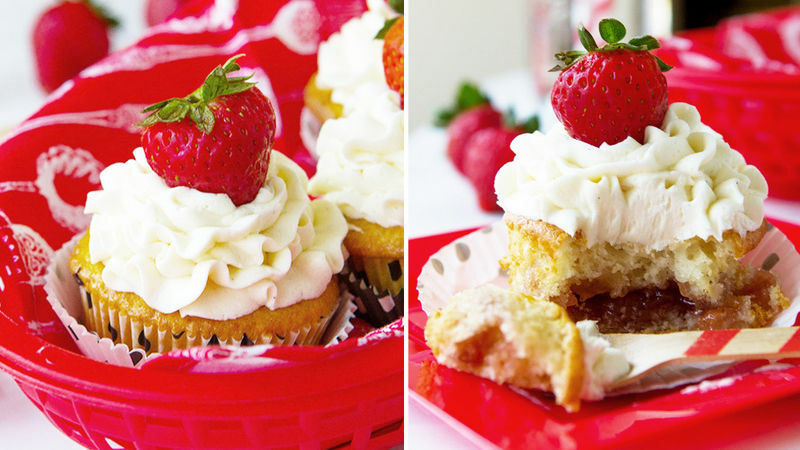 These grilled cupcakes with luscious strawberry filling will let you live out the rest of summer deliciously. Summer be like ... hot. But my belly be like ... cupcakes. Sometimes it’s hard to make your cravings match the seasons. So, rather than stop my maniacal need for all things pastry – even in the summer when the mere thought of kickstarting the oven can melt your face off – I decided to master the art of cupcake grilling. PEOPLE, DID YOU HEAR THAT? It’s totally a thing. It’s totally a mix-up-batter-then-cook-them-cuppies-on-the-grill thing. And Imma gonna showya howta do it. Start with a Betty Crocker cake mix. Grab yourself a pretty checkered spoon and a shiny bottle of Cascadian Farm strawberry fruit spread. No substitutions. Unless, of course, you have a platinum-and-gold checkered spoon. In that case, always use it. Fill a cupcake tin (just nab a cheap one from the dollar store. You won’t worry about it going on the grill) – cupcake wrappers, batter, jam on top. That's it. Then, whap that baby on the grill. And forgive the photo above. Because, um ... hello flat daytime lighting. Let your cuppies chill post grill, then frost their tops with whippy homemade frosting. Add a strawberry on top too, if you want to. Bask in the glory that is homemade cupcakes without a hot kitchen – and kiss your cravings hello.